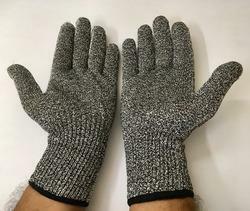 These gloves are knitted seamless nylon gloves with Cut Resistant Safety Hand Gloves. which assure maximum comfort and minimum hand fatigue. Cut Resistant Safety Hand Gloves feature a revolutionary new surface treatment that provides a superior grip never imagined under the dry , wet and oily conditions. Sandy finish adjusts to different conditions by reaching like tiny suction cups that attached themselves firmly to the material being handled. 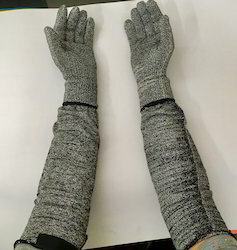 HPPE Yarn Knitted Gloves Cut Level 5 ( Tachfeel ) adjusts to different conditions by reaching like tiny suction cups that attached themselves firmly to the material being handled. The world's strongest fiber : 15 times stronger than steel; 40% stronger than Aramid fiber. It is the only "superfiber" that does not break if bent or folded. This means performance remains the same no matter how many time the hand is flexed or fingers bend. All day performance. This yarn has the best abrasion resistance of all fibers. Its abrasion performance is between 2.5 and 8 times better than other fibers. When conditions are wet it boasts even better performance up to 40 times better. The glove’s cut resistance performance remains predictably and consistently good. 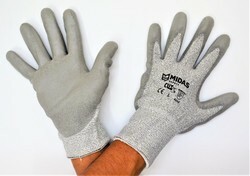 We are offering Cut Resistant Hand Gloves Cut Level 3 Midas Make to our clients. alt and pepper design for universal applications. 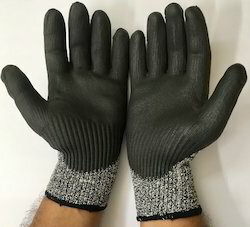 HPPE Dyneema Yarn Knitted With Blue PU Coating Gloves Cut Level 5. This yarn has the best abrasion resistance of all fibers. Its abrasion performance is between 2.5 and 8 times better than other fibers. When conditions are wet it boasts even better performance up to 40 times better. The glove’s cut resistance performance remains predictably and consistently good. We offer specially designed Technion Aerolite -5 Hand Gloves for protection againstrough and abrasive surfaces. 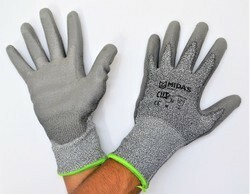 These gloves are manufactured using 7G machines that results in a seamless knitting. The raw material used in the manufacturing of these gloves are soft & comfortable yet provides adequate protection. 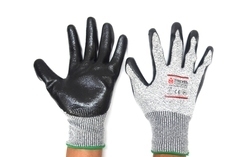 We offer the cut resistant gloves in the standard size of length 22 cms. These cut resistant gloves, available in polyurethane and nitrile coating options offer excellent resistance to cut, puncture and abrasion and are widely accepted for its light weight and excellent dexterity. Available in options of UHMWPE wrapped steel core and glass core options. HPPE Sleeves are high performance polyethylene Sleeves that are specially designed to protect the hands from scratches, cuts, and abrasions when handing sharp and abrasive objects and materials. They are generally machined woven with polyethylene fibers. Most of these Sleeves are rated by how well they will protect your hands, such as level 2, 3, and 4. They are the perfect solution when using machinery that could potentially cut the hands and/or produce sharp fragments that could pierce the skin. They are also perfect for handling scrap metal and scraps of glass. Sometimes thin HPPE gloves are used as liners beneath other types of gloves. In this way, you can protect your hands in more than one way. For example, if you are working in very cold conditions, you can wear HPPE gloves to protect your hands from cuts and an outer glove to keep your hands dry and warm.